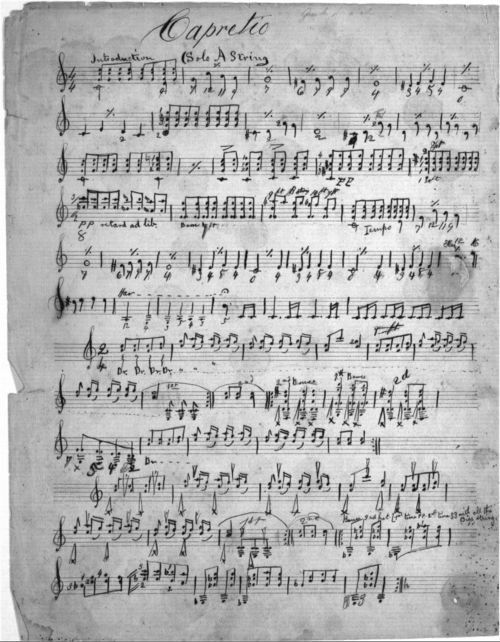 A manuscript copy of a guitar solo titled "Capretio" by Henry Worrall. Worrall published his solo guitar instrumental "Capretio on a Mexican Air" about 1866 with Oliver Ditson & Co. of Boston, Massachusetts. The copyright of this piece was credited to J.L. Peters and Bro. of St. Louis, Missouri. Worrall's manuscript copy of his "Capretio" [presented here] may date from an earlier or later period. In the early twentieth century, Worrall's popular guitar instrumentals played a key role in the development of the guitar styles of southern rural folk musicians and country and blues musical idioms. Worrall moved to Topeka, Kansas, in 1868 where he died in 1902.